“The library? It’s Miss Walsh.” From 1923-1963, the library and Miss Walsh were synonymous. A diminutive, gracious, and dedicated librarian, she had a tremendous impact on the community of Cumberland, Maryland, with many of today’s citizens still fondly remembering their experiences with her. She was offered the task of creating the first public library in the town in 1923. With an appropriation of $2,000 and 1,650 books, she took it from a small office building on Greene Street to its present location on historic Washington Street in 1934. 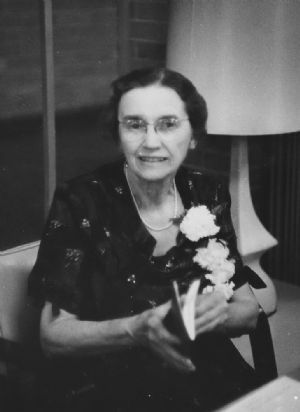 Miss Walsh retired from the Allegany County Library System in 1963, and died in 1982. Her family were prominent in Cumberland. One of her brothers, James, became a Maryknoll priest, the first Catholic Bishop in China, and was later incarcerated there for 12 years. The Bishop Walsh School in Cumberland was named for him.